PirateBay Founders To Start New File Sharing Service – Legally? Two of PirateBay founders have started a new file sharing service called BayFiles. The name is a fitting reminder of just where these guys came from, but according to details about how the service works, it will not operate like PirateBay—in other words, BayFiles will operate legally. Despite this claim, some still believe they are operating in a gray area plagued with many problems. As opposed to PirateBay, among other illegal file sharing services, BayFiles intends to run its service much like MegaUpload or RapidShare in that users can upload whatever files they want, obtain a “private” link and be able to share this link with their friends. What makes this different is that at no time will anyone be able to search a database looking for files and then download to their heart’s content. However, sharing links with friends is a loosely restricted process. Of course BayFiles is reducing a great deal of copyright infringement, but just like with MegaUpload and RapidShare, who’s going to stop someone from posting the “private” link on the Internet?! Once that happens, how long will it take for an influx of copyright infringers to disseminate the content? It looks like BayFiles has the answer to these questions. They say that they are geared up for the takedown of any infringing content that’s reported to them by copyright holders. The catch is that since users are not able to search endlessly for files they want, copyright holders can’t either. This means that copyright holders would either have to get lucky by stumbling across their illegally shared content out on the Internet or they will have to actively search for it themselves through other search sources like Google. A beast of this nature would never hold up against U.S. copyright laws, so instead BayFiles is being run out of Hong Kong. Since their terms indicate that they do not tolerate the uploading of copyright-protected content, BayFiles will be able to bypass any copyright laws provided that they follow through with removing the infringing content. This way they can claim that they had no prior knowledge of these files being made available to the public. The service has both a free and paid options, with paying subscribers being able to upload and download without any limitations on size and speed. The monthly price is €5 which equates to just over $7. As mentioned, this service will be near impossible to monitor for infringing material, but the silver lining could be that if users can’t search for stuff, then maybe your stolen content won’t reach that far into cyberspace. On the other hand, if it spreads like wildfire, then you’re likely to get wind of it just as fast as anyone else. Either way, there may never be a final solution to stopping digital piracy because there are just too many ways to get stuff these days. So unless all of the countries adopt similar laws regarding copyright policies and then begin to pursue violators, then we’re sure to see more and more avenues leading to stolen materials opening in the future. I’m sure even if BayFiles fails, they’ll be 5 more startups ready to fill the void. Apple to ban iPhone cameras at concerts? There are days when I love technology and then there are days when I hate to see the power that it can have. Apparently, Apple is developing software and hardware that can render an iPhone camera useless in very specific situations. According to them, infrared devices can be used to disable all “capturing” features of the camera and/or any other app that has capture capabilities! Apple states that infrared devices could be installed on a stage for example and shoot out infrared signals into the audience. Anytime an iPhone is pointed toward the stage, the signals will tell the device not to allow capturing. Whether it will shut off the camera app completely or simply take a blacked out photo is unknown. However, Apple also states that the technology could be used to allow pictures to be taken, but apply a watermark to it declaring its copyright status. On the flipside, this technology could be used as a search tool. Say you’re in a museum and you want to know more about a painting or sculpture. Simply take a picture of it and those same infrared signals could be used to send informational data to your device for further research. I can think of at least two other big industries that might implement image blocking technology. 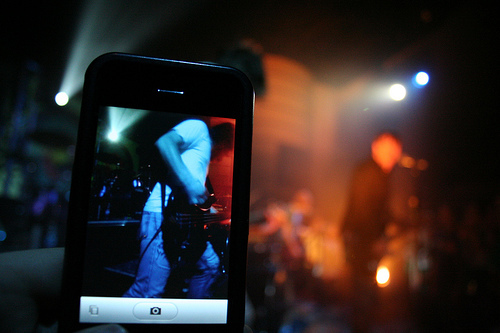 Today, more and more concerts and events are banning the use of cameras and recording devices. Long gone are the days where you went to a concert and you got to see the flashing lights of thousands of little cameras in the audience. In those days, nobody seemed to care because there was never anything on the consumer market that could be of any “print” quality for someone to bootleg. At best, you got a blurry, over-exposed shot of a performer on stage, which made good for your personal photo album, but could never be sold to Rolling Stone magazine. Nowadays, anyone with a few hundred dollars can get insane quality cameras that fit into your pocket and with the use of sites like Facebook and Twitter, you could capitalize on so many different fronts when it comes to distributing content that you don’t own. While this could pose a negative threat to a musician, does it really warrant the use of device-disabling hardware? I mean seriously—with today’s concerts being so dark and in such large venues, do these artists really care about an iPhone picture floating around the Internet? You can’t zoom (with any usable quality) and you can’t flash adequately from far away, so what kind of pictures are you really going to get? Or maybe video…ok I can kind of see the point here, but how does this shaky, no-zoomed video taken from the top section compete with the official DVD release bound to hit the shelves? I’d say who cares…let the fans get some memories for their Facebook page, prosecute only serious offenders of your copyrighted work and just sit back and be happy that people are actually buying your overpriced concert tickets. But I’m not a musician, so I guess I can’t relate. Now here’s probably the only valid reason I can think of to use this technology. Movie theatres already use night vision cameras to scope the audience looking for people who brought their camcorders into the latest blockbuster, but this new tech would literally put a stop to anyone planning on using an iPhone to record the film. Of course this doesn’t seem to address the issue of using some other video recording device, but if this takes off, I’m sure it’ll open plenty of doors for similar protections across a slew of other devices. However, who really wants a copy of a movie that is likely to be very shaky, a little out of focus and has sound coming from a tiny tin speaker? Of course the argument could be made that if someone could watch a new release (of any quality), they would probably not spend the money going to the theatre to watch it. While this might be true for a very small number of people, I have to disagree. The way I look at it is if you really want to see a film in all it’s big-screen glory with chest-pounding sound and all, you’re going to buy a ticket. If you’re not, then you probably wouldn’t have watched it anyway, but figured you’d take a gander because you found a free download online. To me, nobody loses here. Attention movie studios, go after the real threat…people who are making real copies of real DVD and Blu-ray discs because I can completely see people wanting to save 50% off of buying a copied version over the retail version of a movie. In this case, real money is lost. Movie theatres can then focus on the real crime going on at the movies—patrons trying to sneak in cheaper candy and snacks from outside sources and those people that buy one ticket only to bounce around inside the theatre watching more than one movie on a given day. You know who you are! As a photographer, the thought of my camera being disabled is horrible. I understand where and when I can use a real camera, but I always look to my iPhone in times where I don’t have access to a real camera and as such, I would never expect to take “great” photos with it. What this means is if I’m taking pictures with my iPhone, it’s because I wanted to snap a quick shot of something funny and post it to my Facebook. Or maybe I just wanted to share a memory or two. While I do understand that piracy and copyright infringement run rampant today, I think this is a bad solution. The day this technology is implemented is the day I no longer own an iPhone.